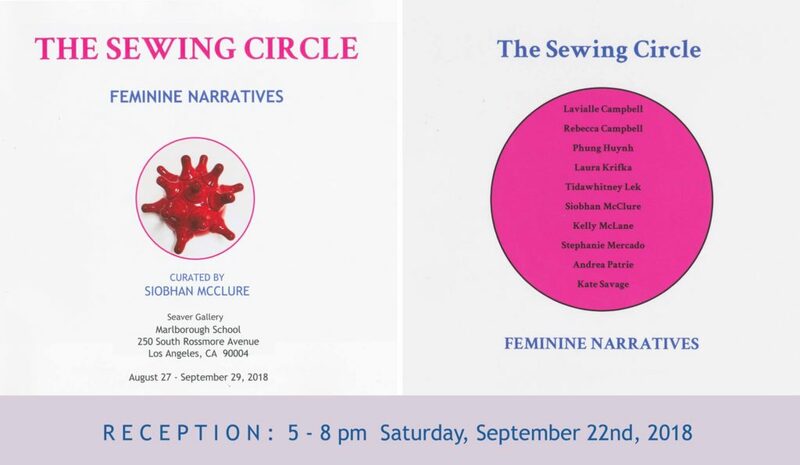 Join us Saturday, September 22nd for the opening reception of The Sewing Circle at Seaver Gallery, from 5 – 8 pm. The exhibition features new work by ten artists in Los Angeles. The artists included in the show are Lavialle Campbell, Rebecca Campbell, Phung Huynh, Laura Krifka, Tidawhitney Lek, Kelly McClane, Siobhan McClure, Stephanie Mercado, Andrea Patrie and Kate Savage. Stephanie Mercado will have three new monoprints included in the exhibition. The monoprints are constructed using relief and linocut prints hand-printed on Thai and Japanese paper. Each element is individually incised and collaged together to create innovative narratives. Stephanie Mercado’s paintings and prints examine and interpret how history is recorded. She merges historical imagery with contemporary pop-culture, transforming the narrative by introducing gaudy gold chains and cartoonish dollar bills. These contemporary elements reveal how the power of images has influenced American culture, fostering the proverbial “American Dream”. Mercado’s recent portraits of maids tell a story about power, class, and human relationships. They explore themes of subjugation and the nuances by which people try to maintain their identity, dignity, and independence. Their black and white uniforms define a role that depersonalizes them but elements in their environment reflect individuality and an exploration of identity. Each figure is caught in a place between reality and a world that is deformed and shaped by the people who control their environment and their livelihood.